If you ever find yourself shopping for bootlegs computer accessories at Pantip Plaza in Bangkok, do yourself a favor and skip out on the foreigner friendly fast food chains and S&P (I’m not knocking S&P) found on the ground level. Instead walk across the street to Soi Som Prason 4. A short walk up the street is Mama’s. Mama’s is cheap, lacking any kind of ambiance (save for the orange chairs) but has surprisingly good food at an ever better value. If you have Pantip Plaza at your back walk across the foot bridge to the other side of the road. You should see the following sign. Head up this road and you’ll soon spot Mama’s on the right hand side of the road. The people who told me about the restaurant called it “orange chair restaurant” due to the chairs. There’s no real sign up, just a menu posted on the wall. The real menu is much larger than what’s advertised here. Don’t worry, if you don’t read or speak Thai, they have a picture menu with dishes listed in English. 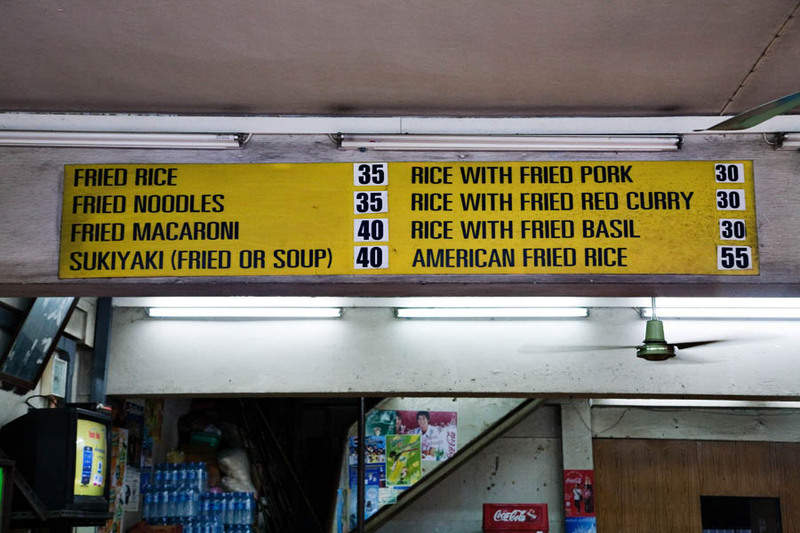 This is one of the cheapest meals you (and your bowels) will comfortably have in Bangkok. Seriously, any cheaper and dirtier than this place and you’re just asking for a world of hurt. I love to come here for the Yam Plu Duk Fu (crispy fried catfish with mango chutney). It’s crispy, spicy and a touch sweet. 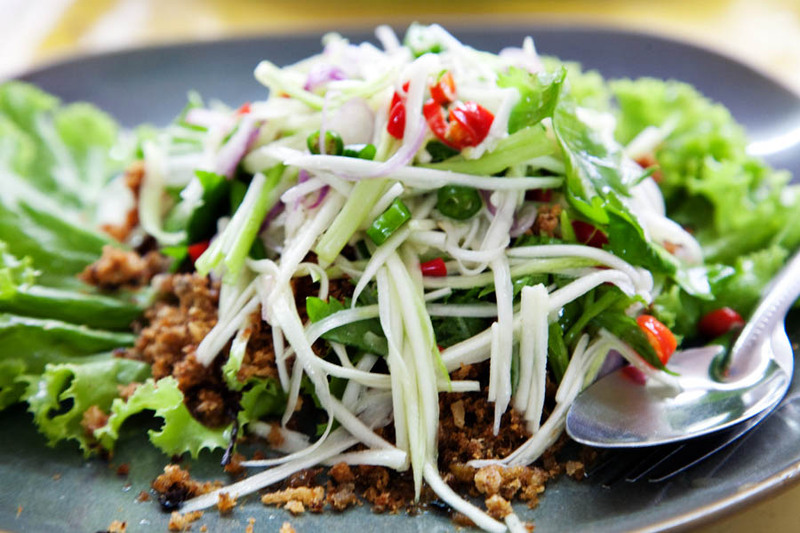 This is my favorite Thai dish and Mama’s sells one of my favorite versions. Sure there’s fluffier catfish sold at other restaurants, but I kind of prefer this dish a bit more rustic… and cheap. At 50 THB (1.50 USD) it’s just good value. 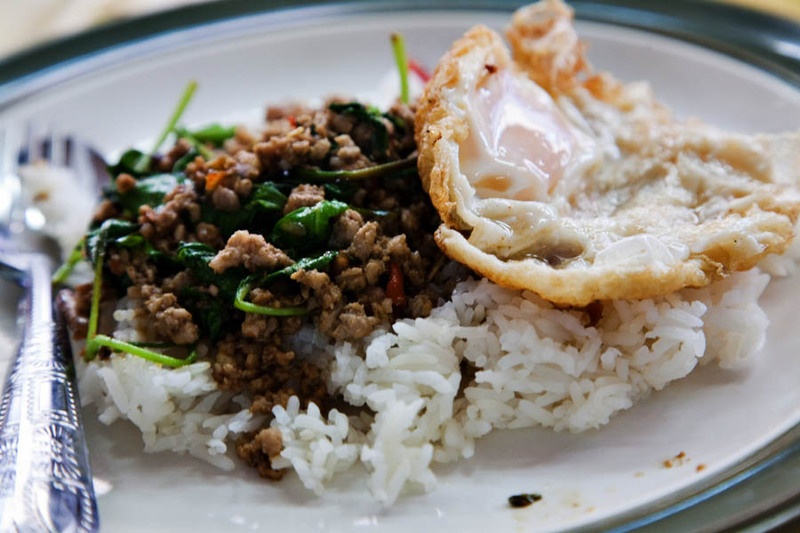 The Pad Kra Pao (Gai – Chicken or Moo – Pork) with fried egg on top here is also good. 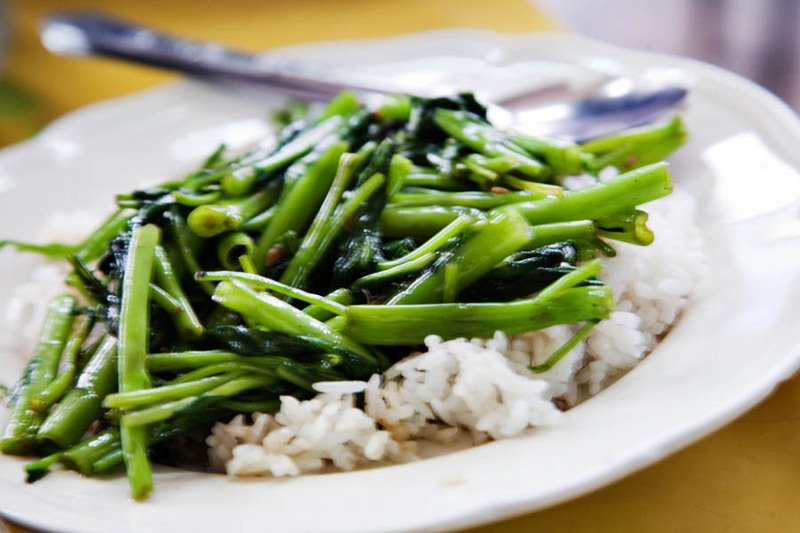 The Pak Boong Fai Dang (morning glory fried in oyster sauce) here is interestingly served with rice. Normally this comes out as a plain veggie side dish. Here they serve it up with some steamed rice which serves to catch all that great stir fry juices (usually the best part of the dish). A small touch that adds a lot of enjoyment to the meal. Thanks for the insight. Just moved to BKK. 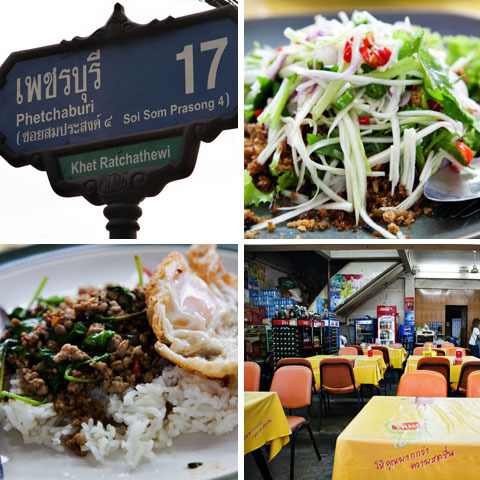 Looking forward to finding this place and trying some cheap eats! Have been eating here for years when in Bangkok with work. As stated above its a very local style restaurant (doubles up as the garage for the family car at night when the restaurant closes !) but the food is authentic, and its brilliant value for money. 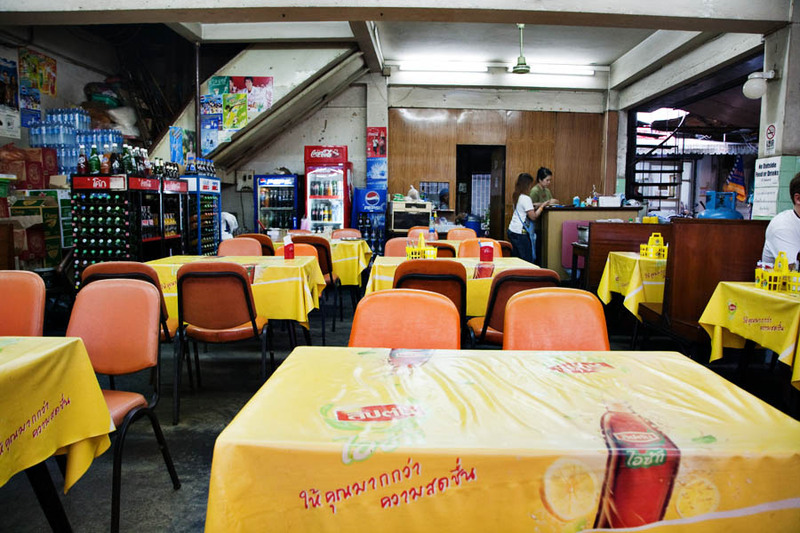 Its owned by an elderly thai couple, and you usually see Mama sat at the desk in the back, she looks after the money. Her husband, along with their younger son is usually on the restaurant floor. They are really friendly and always acknowledge you when you arrive with a proper thai smile. 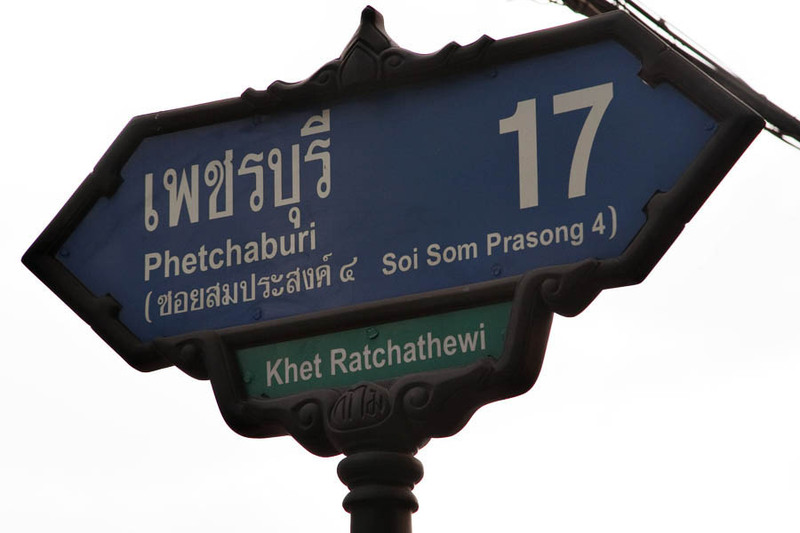 A tiny bit of thai goes a long way here, as English is a bit sparse.